Like many people who deal with anxiety, I’ve learned to live with it. And I’ve hidden it well from my daughter. Or so I thought. 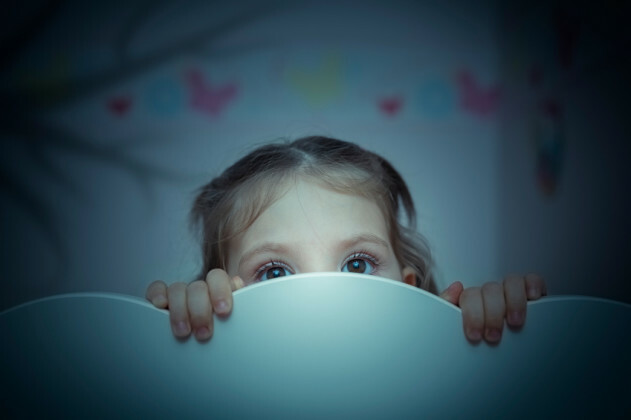 My own fear is traceable enough, its origins obvious, but my daughter’s fear is a mystery. She’s only 8, for one. She has suffered not at all, not more than the unconscious absorption of my fear, which would appear to be enough to give her a legitimate apprehension of the dark, of loud noises, of eating a lollypop as soon as its acquired, of wasting her allowance money, of adults who drink too much, of “inappropriate images” like Victoria’s Secret advertisements and perhaps, most painfully, of her parents’ near constant state of distraction. She is almost always trying to catch me in the act of inattention, or even of joyless attention, which might occur, for example, at a school function like “Science Night.” And this terrifies her. Why? I had all the same fears as a kid, though mine were less mature, more general. I didn’t know to be afraid of adults who drank but I should have. My adults drank, too much, and if I’d known that I might have been able to understand their mercuric moods. As I got older, the importance of my parents drinking, the role it played in my anxiety, had become sparklingly clear, and a hippie therapist I hired to cure me of bulimia suggested I attend an “Alateen” meeting. It’s a teenaged version of the recovery program, Al-Anon, aimed at the dependents and lovers and friends of alcoholics. Or I guess it is. I didn’t stay for the meeting. Something about the way my therapist described it made me envision a place where my issues would be honored with the kind of attention and significance that was only awarded adults. I had high hopes. But when I laid eyes on the metal folding chairs in the musty basement of a church on the Upper West Side, (a 12-Step meeting cliché straight out of central casting) and the other kids, like me, waiting for the meeting to begin, I balked. They were shoving each other and smoking and laughing (you could still smoke indoors in New York in those days) and I thought, this is just another way adults ignore us—lump us together and walk away. I wanted to vomit and run, which I did. In the ladies room, then up the basement steps to the cold sidewalk, and then back to our apartment. It was decades before I’d attend an ALA-anything meeting again. By then the source of my fear and anxiety had been made boringly clear, through therapy, prayer, 12-Step meetings, whatever, but my awareness didn’t do much to reduce it. Even now, when my husband is late coming home, I assume that he’s been in a fatal accident. When a friend fails to return a text message or phone call, the same. But like many, many people who deal with anxiety, I’ve learned to live with it. And I’ve hidden it, well, I think, from my daughter. Her life, unlike mine was at her age, is safe, calm and happy. “Mommy!” she screams. She’s been watching a television show in an upstairs bedroom and I am downstairs, loading the dishwasher, or writing an essay, or taking out the trash. It’s only been a few minutes since our last interaction. Maybe five. “Mommy!” she repeats, her voice escalating into a shriek fit for a horror movie. She doesn’t hear my response over the laugh track on her TV show. With my head in the dishwasher or, worse, if I am halfway to the curb with the garbage, she doesn’t see me when she comes bounding down the stairs, and her fear—of being abandoned? Of me disappearing?—is realized. She is inconsolable until she finds me again, doing some accepted Mom-work. But lately even that is not enough. She wants to know not just where I am but what I am doing, exactly, and why. “Maybe you shouldn’t read that!” she announces, after I delicately try to explain to her why she can’t read what I’m reading, for example, Kristen Dombek’s essay “Letter to Willamsburg.” I am reading at the dining room table while she does math homework. “Does it have bad words?” she asks. “No. It’s just…not for kids,” I say, weakly. “Well if it’s inappropriate, then maybe you shouldn’t be reading it!” she says. I understand her point very well. But I am an adult. And my reading this essay does not in anyway threaten or harm her. It seems as though the boundaries I’ve set between her and the world (between her and potential child-molesting strangers, between her and “inappropriate” books or movies) have begun to hem me in, too. When this started, maybe a year ago, when she called to me like that—with that fear in her voice—I thought she was being abducted or had fallen down a flight of stairs, or worse. But there’s a strange “boy who cried wolf” phenomenon at work between us now. There is plenty to fear for a girl growing up in the world today. But for the time being, I’ve grown numb to my daughter’s fear, and that scares the hell out of me. Cameron Dezen Hammon lives in Houston with her husband and daughter. She is an MFA candidate at Seattle Pacific University, and her work has appeared in NYLON Magazine, Gigantic Sequins and Killing The Buddha.